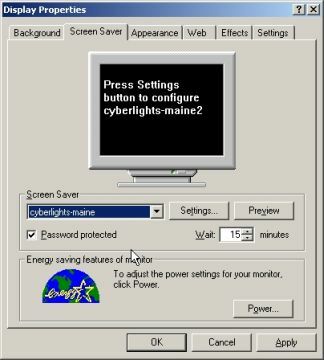 We've created these FREE screensavers for all the lighthouse enthusiasts on the internet to use on your PCs running Microsoft Windows 95, 98, ME, NT4.0, and XP (sorry, no Mac). All our screensaver installation files (.exe) have been scanned prior to uploading to our website using both McAfee VirusScan and Clam AntiVirus to ensure the installation executables are virus-free. 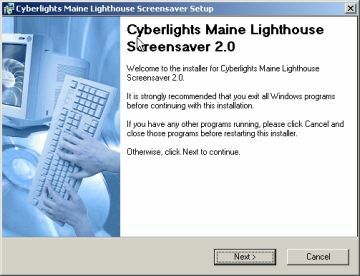 The screensavers are described below. This screensaver includes original photos from 32 lighthouses in Maine, from Nubble Light in York all the way up to West Quoddy Head Lighthouse in Lubec. 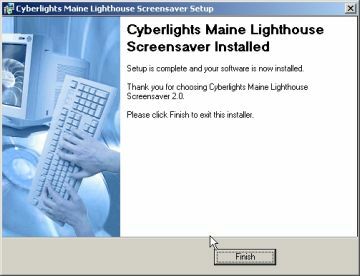 This screensaver includes original photos from 30 lighthouses in Maine, New Hampshire, Massachusetts, Rhode Island, and Connecticut. This screensaver includes original photos from 16 lighthouses along the southern coastline of Lake Michigan in the states of Wisconsin, Illinois, Indiana, and Michigan. This screensaver includes original photos from 17 lighthouses along the southern coast of Lake Erie from the states of Ohio and Pennsylvania. This screensaver includes original photos from 16 lighthouses along the coast of California, mostly from the San Francisco area north to the Oregon border. This screensaver includes photos from 8 lighthouses along the Oregon coast. 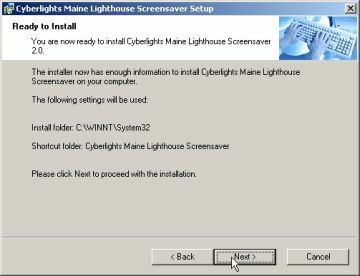 All the screensaver files on this page come contained within an installer program. First, choose which screensaver you want to download and install. Download the file then run it. 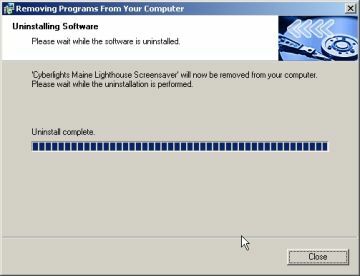 Follow the onscreen instructions to install the screensaver. Below are detailed instructions. 1. When you run the EXE file you'll get a Welcome screen. Click on NEXT. 2. The next screen gives you some information about what the installation will do. 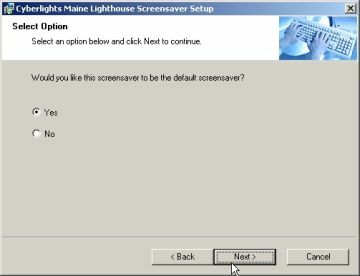 In short, it installs the .scr screensaver file then it asks you if you want that to be the default screensaver. 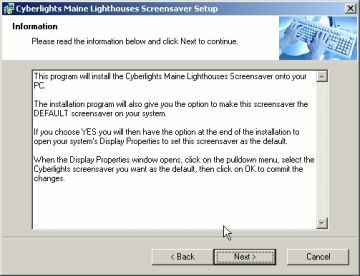 If yes, you have the option at the end of the install to open your system's Display Properties to set the default screensaver. Once you've read this window, click on NEXT. 3. You are now asked whether or not you want this screensaver to be the default for your system. Choose either YES or NO. The default is YES. Once selected, click on NEXT. 4. Next the install will inform you of what steps it will be doing. Click on NEXT. The program will now install the screensaver file into the proper system directory. 5. If you chose YES for default screensaver, the installation finishes with a screen asking if you want to open the Display Properties window. If yes, click on the checkbox. If not, uncheck the box and click on Finish. 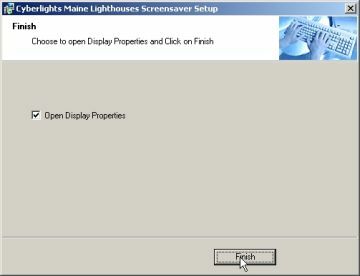 For instructions on how to navigate through the Display Properties window, go to the next section - Selecting screensaver from Display Properties. 6. If you chose not to have the screensaver be the default, you'll get a window where you just need to click on Finish. If you installed the screensaver, chose it to be the default, and selected on the "Finish" screen to open the Display Properties window, skip to STEP 4. The Display Properties window should already be open. If you didn't choose to open the window, or later decided you want to change what your default screensaver is, follow the steps below to open the Display Properties window. 3. In the Control Panel window, double-click on the DISPLAY icon. - Click on OK to accept the change. I'm sure you'll never want to uninstall our screensavers. But if for some reason you do want to, it's a simple process. - Double-click on the Add/Remove Programs icon. - Click on YES if you want to continue with the uninstall. When the install is complete you'll see the following window. Click on CLOSE to exit the window. - The uninstall is now complete. The screensaver file has been removed from your system.